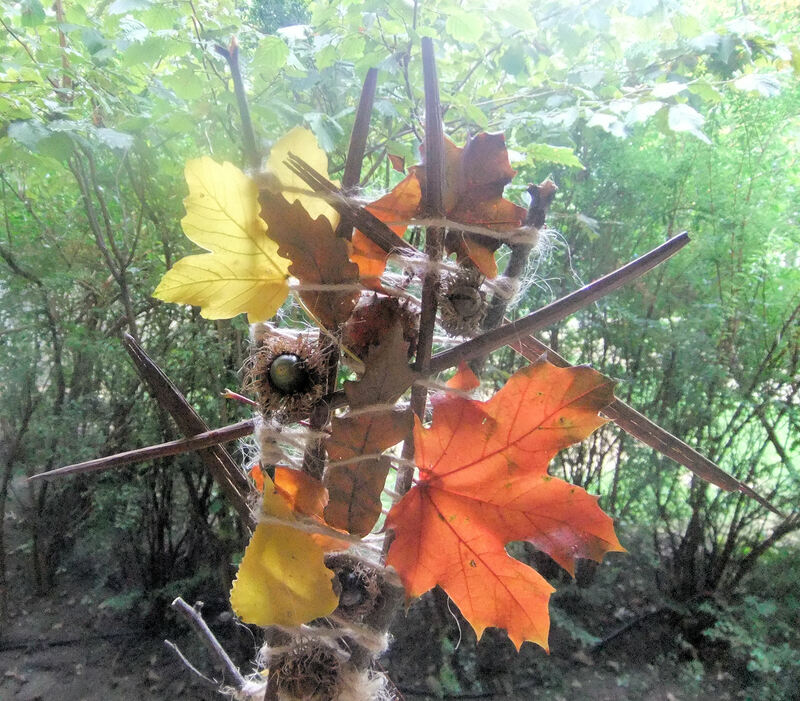 This art project was inspired by the beautiful autumn treasure beginning to clutter the ground in parks throughout Vienna – leaves in every shade of yellow, orange, red and brown, acorns in their wonderful furry cups, long brown seed pods and horse chestnut shells, brown or green and spiky. The conkers (chestnuts) themselves were unfortunately a bit too slippery for this activity! 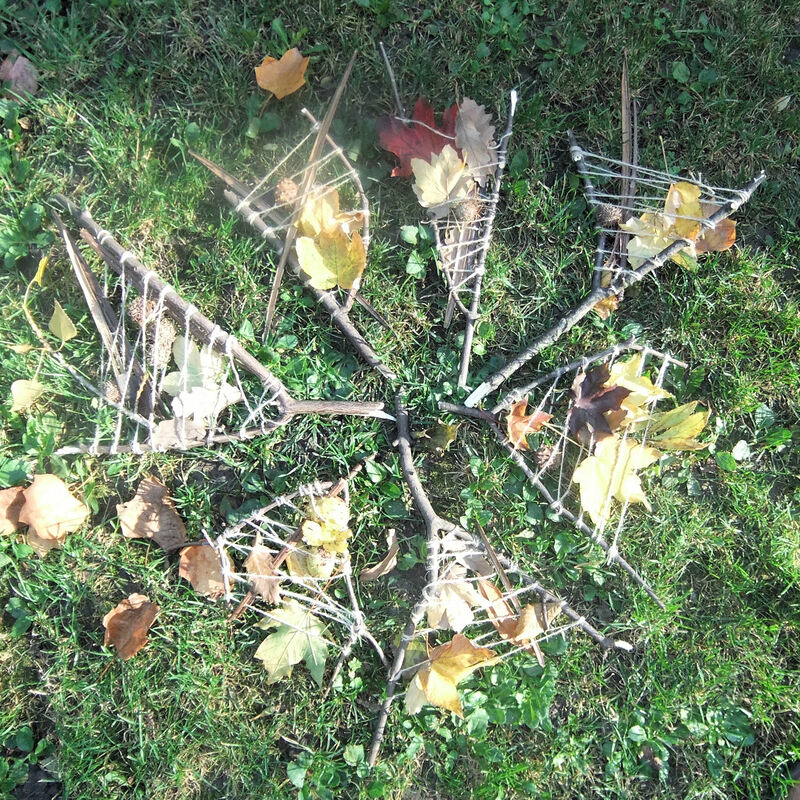 Before the class, I prepared a twig ‘loom’ for each child by winding string back and forth around a V-shaped twig. Any kind of string, yarn or twine would work this, but I prefer natural fibre string for its organic colour and texture. Older children could string their own looms, but my students, aged between 3 and 6, would have struggled with this and I didn’t want them to get frustrated and bored before the fun part began! 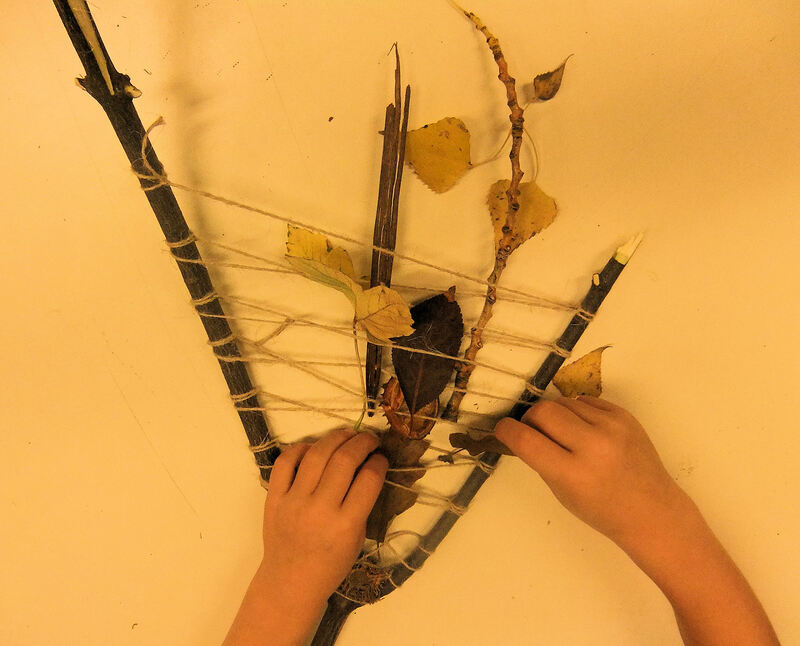 The children chose items to weave into their twig ‘looms’, being careful to tuck each leaf under and over the string so it would not fall out straight away. I encouraged them to use a variety of colours and textures. 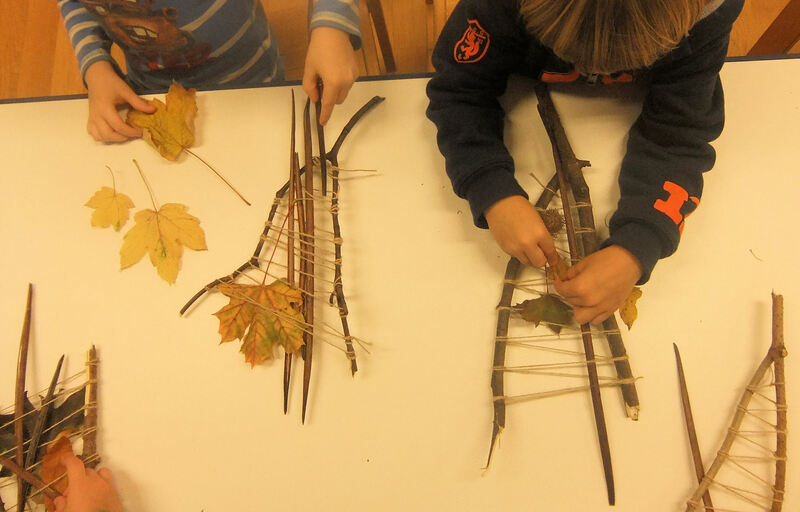 The long, spiky, seed pods were very effective in adding strong lines to the sculpture, and some children wove these diagonally across their looms, rather than just vertically. 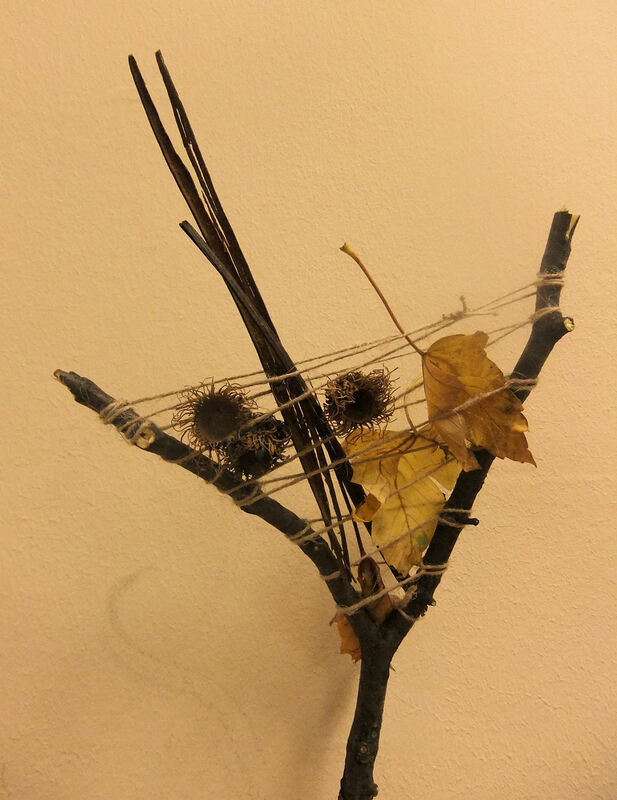 The kids also suspended a few acorn and chestnut shells within the criss-cross weave – the spiky surface of the chestnut shells and the fuzzy texture of the acorn cups helped them to cling to the string, but it was still quite tricky getting them to stay in place! 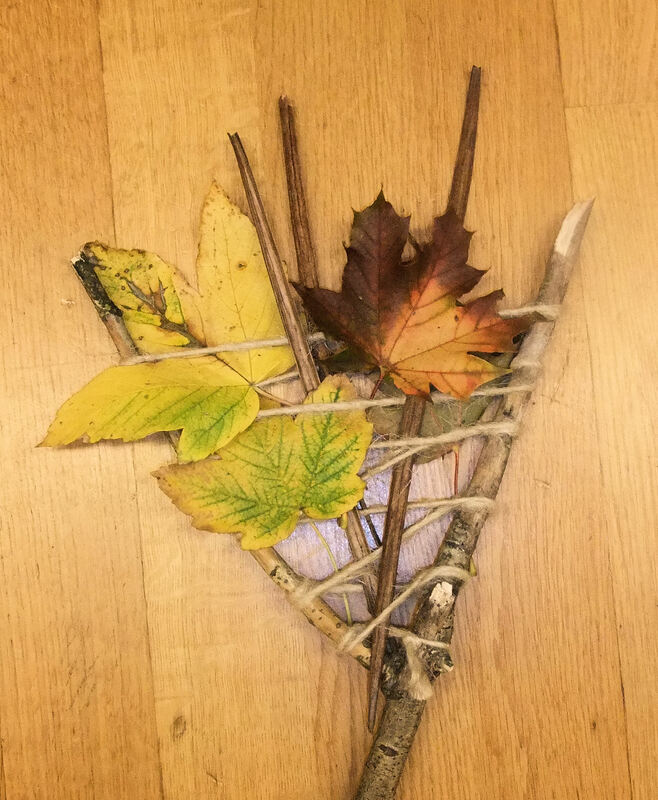 When the sculptures were finished I showed the children some photographs of natural artworks by British artist Andy Goldsworthy, who builds sculptures in nature using only natural materials, for example, twigs. 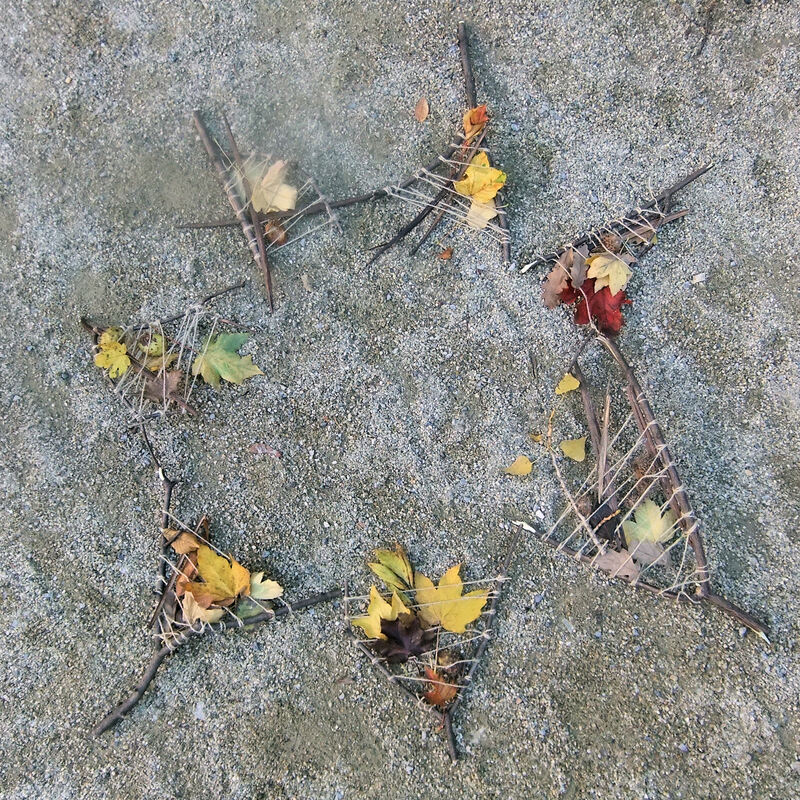 stones, leaves, flowers, sand, ice and water. 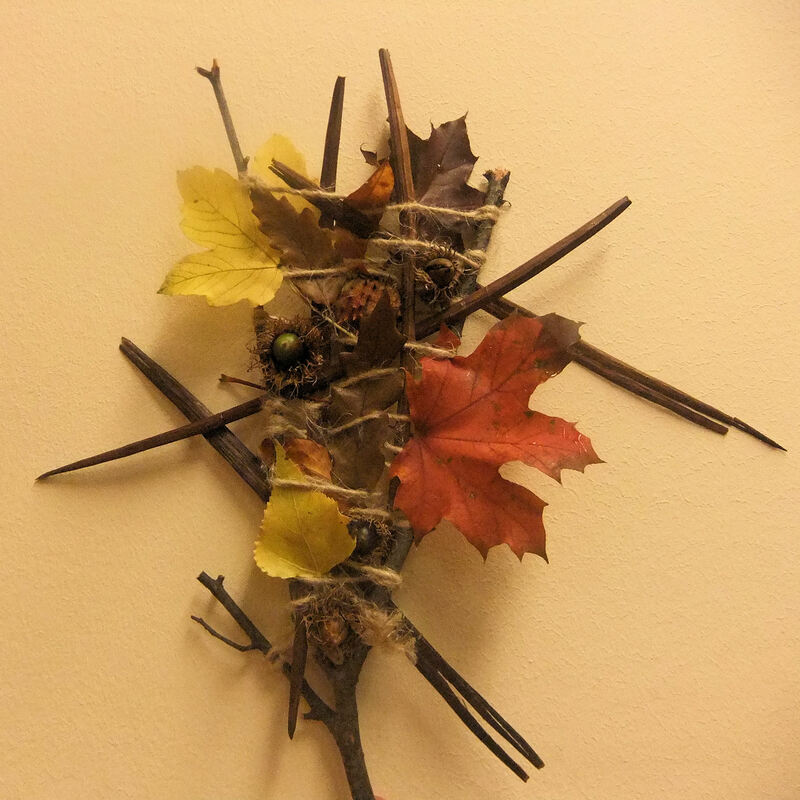 Goldsworthy never uses glue or tape to fix these items together. 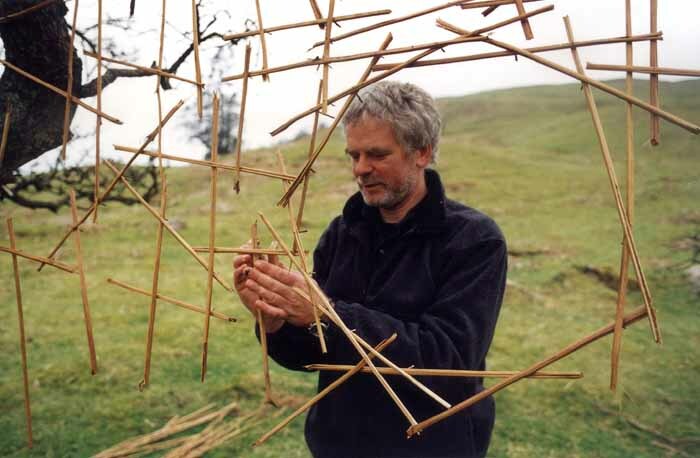 He only uses what can be found in the location where he is working, sewing leaves together with grass, fixing twigs together with sharp thorns, or weaving his natural materials together. 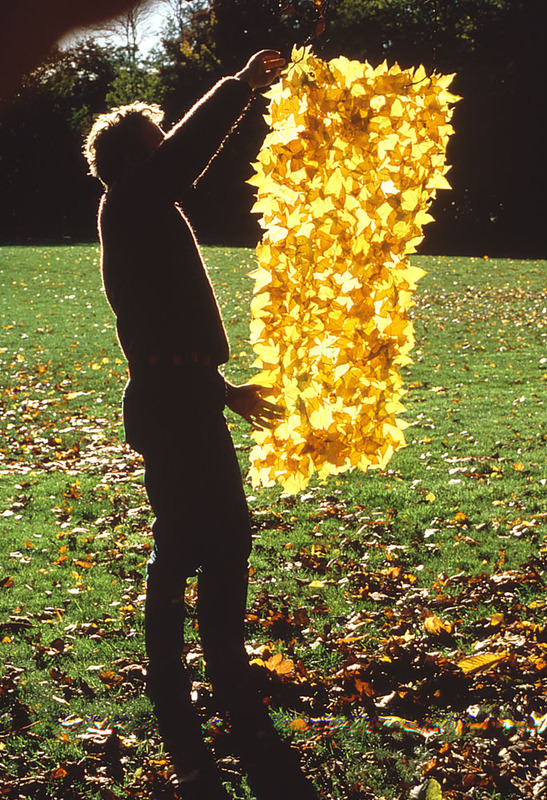 Goldsworthy always photographs his sculptures in their natural surroundings, so that he has a record of them before they get blown away, fall apart, melt or decompose. The locations of his art works are very carefully considered, so that they fit harmoniously with the landscape. We also finished by taking our sculptures outside to photograph them in their natural habitat. 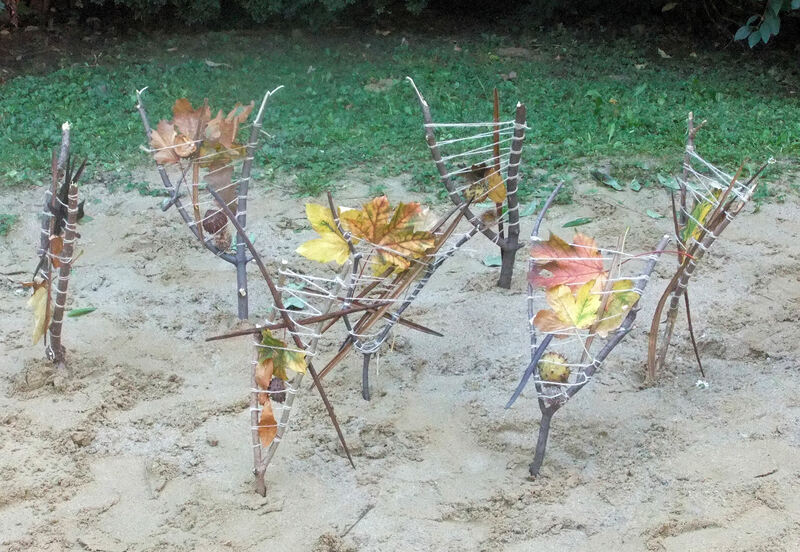 It was fun hanging them in the bushes and standing them up in the sandpit. 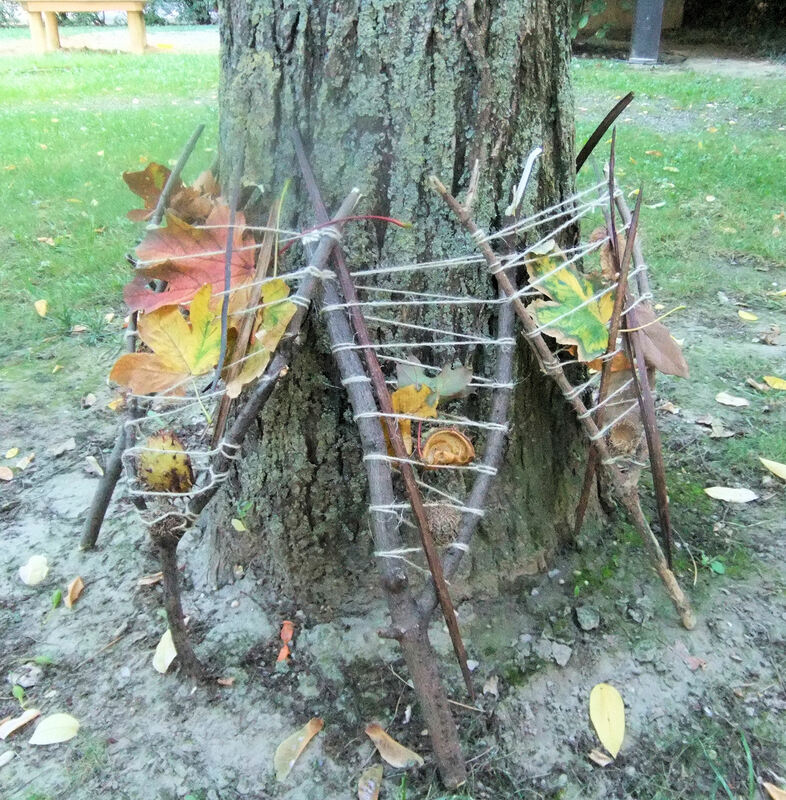 We decided that the looms looked best displayed together in different formations, standing up “like a mini-forest” (as one child remarked), encircling a tree trunk or in a star shape on the ground. Developed from an idea seen at Let The Children Play. Stunning!!! I’ll be doing some weaving at my local community garden this Sunday. This is very inspirational.. I love this idea and will try it with my class of 8 and 9 year olds. Thank you for sharing. Det skal vi lave i efterårsferien!